Conceptually described by Lazars in 1826, a maxillectomy was not successfully performed until 1828 by Syme. Early maxillectomy attempts were unsuccessful primarily because of excessive blood loss. Its high mortality and secondary deformity led to the widespread adoption of irradiation as the preferred treatment for cancers of the maxilla. In 1927, Portman and Retrouvey described a sublabial-transoral approach that obviated scarring from external incisions, such as a lateral rhinotomy or Weber-Ferguson. Around the 1950s, advancements in anesthesia, blood replacement, and further improvements of the surgical technique propelled the popularity of the radical maxillectomy. 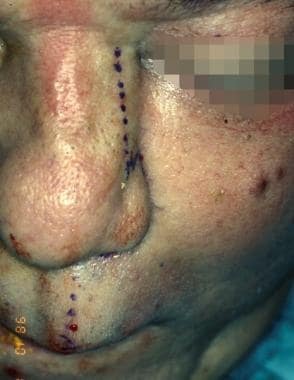 During the 1970s, the midfacial degloving approach, which obviated the need for facial incisions in select patients, also gained popularity. Combined treatments, including preoperative or postoperative external beam radiation, led to a modest increase in survival. Currently, endoscopic endonasal resection of tumors confined to the lateral nasal wall is standard at most institutions. 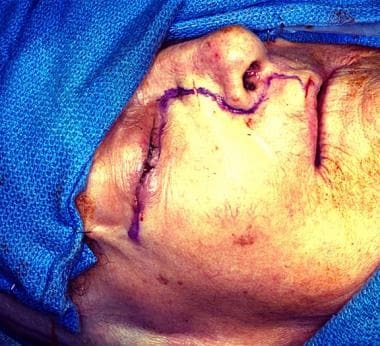 Open transfacial or transoral techniques are still widely employed for maxillary tumors necessitating total or near total maxillectomy. Open approaches are also used to access some skull base and nasopharyngeal tumors. 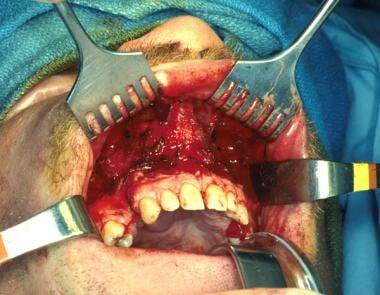 Surgical excision of tumors involving the maxilla is the main indication for a maxillectomy. Squamous cell carcinoma is the most common malignancy requiring maxillectomy. However, various other tumors, either benign or malignant tumors and originating from bone, minor salivary glands, or dental tissues among others, are also seen. 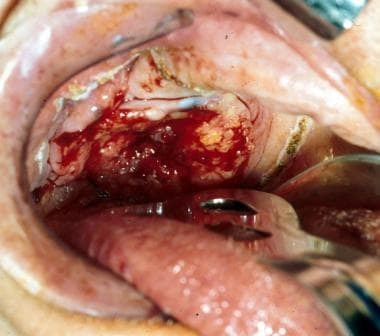 Surgical excision is the treatment of choice for most maxillary sinus lesions, with the exception of malignancies that are highly responsive to chemotherapy and/or radiotherapy, such as lymphoreticular malignancies (eg, lymphoma) and pediatric rhabdomyosarcomas, or when dealing with advanced disease when no gain in life expectancy or quality of life is expected. Combined treatments, adding adjuvant radiotherapy or chemoradiotherapy, are commonly advocated, particularly in advanced stages or aggressive pathologies. A total or complete maxillectomy, however, is not always required. Tumors originating or involving the inferior aspect of the maxillary sinus may be treated by a partial maxillectomy in which only the inferior aspect of the sinus is removed, thus preserving the malar complex, inferior orbital rim, and orbital floor. The precise limits of the resection must be determined by the extent of the tumor. Similarly, tumors isolated to the medial maxillary wall (such as inverted papilloma) are frequently treated with a medial maxillectomy (endoscopic or open). A maxillectomy may also be performed as part of a combined resection of a skull base or nasopharyngeal neoplasm. Rarely, a maxillectomy may be required to treat infectious (eg, invasive fungal infection, chronic osteomyelitis) or chronic granulomatous diseases. The decision to perform surgery depends on the extent of the tumor and the patient's general health, comorbidities, life expectancy, and wishes. Absolute contraindications to a maxillectomy include patient’s refusal to provide consent, lymphoreticular tumors that are best treated by nonsurgical means, or a patient who cannot tolerate surgery due to very poor general condition. These factors, along with the patient’s co-morbidities and experience of the surgical team, guide the treatment paradigm. A multidisciplinary team, often consisting of otolaryngologists, oral surgeons, neurosurgeons, plastic surgeons, dentists, prosthodontists, and speech pathologists, is critical to obtain an adequate diagnosis, stage and remove the tumor, reconstruct resulting cosmetic defects, and rehabilitate functional deficits. Most tumors of the maxillary sinus are “silent” until they reach an advanced stage, producing no direct symptoms; therefore, patients often present with symptoms arising from obstruction of the sinus ostium or nasal airway, invasion of the orbit, alteration of dentition, ill-fitting dentures or involvement of the trigeminal nerve (motor or sensory; see the image below). Anterior rhinoscopy demonstrating a tumor causing complete nasal obstruction. Secondary effects are primarily based on the origin and extent of the tumor; thus, inferior tumors present with more dental symptoms (pain, malocclusion, loose dentition, ill-fitting dentures), nasal wall tumors with nasal symptoms (congestion, epistaxis, epiphora), superior tumors with orbital symptoms (proptosis, diplopia, decreased acuity, or infraorbital nerve involvement), posterior tumors with ear symptoms (decreased hearing, otalgia) or trismus secondary to eustachian tube or pterygoid involvement, and tumors with lateral extension present with facial swelling, pain, and trismus. Increasingly, tumors are identified incidentally due to the widespread use of CT scanning and MRI for evaluation of other symptoms. Similarly, findings during the physical examination are primarily based on the origin and biologic behavior of the disease. Facial, palatal, or alveolar ridge masses are seen as the tumor erodes through bone (see the image below). Intraoral examination demonstrating a tumor eroding through the hard palate. Erosion of the inferior infrastructure can yield loose dentition. Intraorbital tumor growth leads to proptosis and/or alteration of extraocular movements. Hypesthesia of the infraorbital nerve can also occur. Posterior extension can manifest as serous otitis, trismus, or abducens neuropathy. Endonasal examination may reveal a nasal mass (see the image below). Nasal endoscopy showing a friable tumor of the lateral nasal wall. As with any surgical procedure, a thorough knowledge of the pertinent anatomy is required and best obtained through cadaveric dissections, courses, and mentored surgery. Great variability exists between individuals and even between separate sides of the same patient, as the sinuses develop from variable pneumatization of solid bone. The maxillary sinus is a 6-sided box that is wider anteriorly than posteriorly. Its lateral wall and floor are thicker than its anterior, posterior, superior and medial walls. Pneumatization may extend laterally well into the body of the zygoma and posteriorly into the palatine bone. Hypoplasia and aplasia may occur; however, they are uncommon. The maxillary sinus is lined with pseudostratified columnar ciliated epithelium, as is the remainder of the nasal cavity except the nasal vestibule and a small portion of the superior nasal cavity. The nasal vestibule, which corresponds to the ala of the nose, is lined with squamous epithelium, which contains vibrissae, sweat, and sebaceous glands. Olfactory epithelium lines a small part of the superior portion of the nasal cavity (bound by the superior turbinate laterally and the nasal septum medially). Surgical anatomy, as it relates to maxillectomy, should include the discussion of bordering structures, as tumor extensions into these areas most often determines the extent of surgery and need for adjuvant therapy. The superior wall of the maxillary sinus is shared with the orbit, while the pterygoid plates, pterygoid space, and infratemporal fossa are located posterior to the sinus. Ohngren noted that involvement of these superior and posterior areas signifies a poor prognosis. He described an imaginary line extending from the medial canthus through the angle of the mandible. Lesions posterior-superior to this line have poorer outcomes than those anterior-inferior to this line, possibly as a result of the relative ease of resecting anterior-inferior lesions en bloc. Other close relationships include the oral cavity, adjacent paranasal sinuses, nasopharynx, skull base, and intracranial fossa. By understanding these relationships, one can easily grasp the varied presenting signs and symptoms as they relate to tumors of the maxillary sinus. Tumors can breach the boundaries of the maxilla and enter adjacent structures by either direct invasion/destruction of bone and soft tissue boundaries or along pre-existent anatomic pathways. Extension into the nasal cavity can occur early in the disease process. The nasal cavity is a paired structure separated by the nasal septum. The lateral walls comprise the medial wall of the maxillary sinus as well as the inferior, middle, and superior turbinates. Extension into the nasal cavity can be manifest by nasal obstruction and/or epistaxis. Superior tumor extension can lead to invasion of the orbit, which may manifest as ocular pain, fullness of the eyelid, unilateral epiphora, extraocular muscle limitation/diplopia, or proptosis. Superior tumor extension frequently compromises the second division of the trigeminal nerve (V2) as it courses through the superior wall of the sinus and exits the infraorbital foramen. The floor of the maxillary sinus corresponds to the hard palate of the oral cavity; therefore, caudal extension of the tumor can present with loose dentition, palatal fullness, pain, and/or ulceration. Anterior extension can breach the anterior wall of the sinus to involve the overlying skin and soft tissue. This can present as a skin lesion, lymphedema (peau d’orange), or fixation of the skin over the maxilla. Posteriorly lie the pterygopalatine and infratemporal fossae, which are important anatomic areas, as they are densely populated by the mastication muscles, various sensory and motor nerves, and by carotids and other blood vessels that supply the nasal cavity, oral cavity, maxillary teeth, and pharynx. Tumor extension into these areas can present with trismus (from involvement of the pterygoid muscles or motor branches of the mandibular division of the trigeminal nerve), facial hypesthesia (from involvement of the infraorbital nerve or other sensory branches from the maxillary and mandibular divisions of the trigeminal nerve), pain in the maxillary dentition (from involvement of the anterior, middle, or posterior superior alveolar nerve branches of the maxillary division of the trigeminal nerve), or severe epistaxis (from involvement of the terminal branches of the internal maxillary artery). The pterygopalatine and infratemporal fossae are also potential routes for intracranial tumor spread, via direct extension, preformed pathways, or hematogenous spread. Intracranial involvement increases the risk of spontaneous or postoperative cerebrospinal fluid (CSF) leak, meningitis, and intracranial abscess. Further, posterior to the maxillary sinus, the eustachian tubes open into the nasopharynx. Tumor extension into this region may obstruct the eustachian tube and lead to secondary serous otitis media, hence, manifesting as hearing loss. Total maxillectomy and most of its partial variants are performed under general anesthesia with anesthetic and cardiovascular monitoring appropriate to the patient's condition and extent of the planned resection and reconstruction. Although extreme blood loss is unusual, based on tumor size and location, precautions should be taken for the rapid replacement of blood volume should excessive hemorrhage occurs. Most of the hemorrhage is encountered upon transection of the internal maxillary artery in the infratemporal or pterygopalatine fossae. An endoscopic medial maxillectomy does not require anything different from that required for standard sinus surgery anesthesia. Hypotensive anesthesia, if not contraindicated because of patient comorbidities, is helpful in reducing intraoperative blood loss. Avoidance of paralytics is indicated if monitoring of the cranial nerves (EMGs) or brain function (SSEPs) is used. Transoral intubation is preferable, and the endotracheal tube should be secured opposite the side of the tumor on the lower lip, not distorting or tethering the upper lip, which is frequently retracted (and rarely incised) to provide adequate exposure. If direct transoral intubation is not possible or is deemed too risky, an “awake” transnasal fiberoptic intubation should be performed through the opposite nostril. A tracheostomy, under local anesthesia, is a prudent approach in patients with a particularly difficult airway. General anesthesia is induced once the airway is secured. Standard soft tissue and maxillofacial surgery instruments trays are usually adequate to complete a partial or total maxillectomy. A standard endoscopic sinus surgery set-up is used for an endoscopic medial maxillectomy. Reciprocating, sagittal, and oscillating saw blades facilitate the osteotomies, but those over the anterior and lateral walls of the maxilla are best performed with Kerrison rongeurs. This latter technique creates a wide osteotomy that serves as a window to monitor the margins of the resection while avoiding injury of the soft tissues deep to the osteotomy. Similarly, small bone chisels and osteotomes may be used as needed. The patient is positioned supine on the operating room table and rotated 900 from the anesthesiologist (for a medial maxillectomy) or 1800 for a total maxillectomy. Once the bed is the desired position, the patient’s head is turned slightly toward the side of the tumor to improve exposure. If the orbit is being preserved, a temporary tarsorrhaphy or corneal shield is helpful to protect the eye during open approaches. Taping is usually adequate for endoscopic procedures. 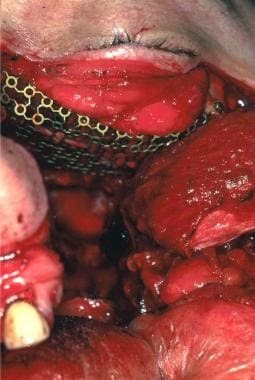 No substitute exists for sound surgical technique to prevent complications; however, technique alone cannot eliminate all complications. Broad spectrum antibiotic prophylaxis is administered prior to the start of the procedure. Clindamycin or ampicillin/sulbactam are good choices because they cover skin and oral cavity flora. A third generation cephalosporin with good cerebrospinal fluid (CSF) penetration is advocated if a concomitant skull base resection is planned. Any incision should be marked prior to infiltration of local anesthesia because this distorts the tissue and leads to inaccurate placement of the incision or even unsightly scars. During closure, precise realignment is important. Its proximity puts the orbital contents at risk in all operations of the maxillary sinus. When preserving the orbit, protecting the eye with a temporary tarsorrhaphy or corneal shield is important. Identification of surgical landmarks, such as the lamina papyracea and skull base, is paramount to preserve their integrity during the procedure. Accidental lacerations of the periorbita may cause herniation of fat and result in postoperative enophthalmos. If a significant laceration occurs, it may be repaired using inlay free fascial graft. Epiphora is best prevented by marsupializing the lacrimal sac, dividing it, and suturing its edges to the surrounding soft tissue. A stent can be used to ensure patency, although it is usually not necessary. In addition, the medial canthal ligament should be accurately positioned to avoid misalignment and to optimize the lacrimal pumping mechanism. Preoperative imaging should be reviewed carefully and the osteotomies planned carefully. An osteotomy superior to the level of the anterior ethmoid artery and frontoethmoid suture may penetrate the cranial cavity and result in intracranial injury or CSF leakage. Dissection that is carried medial to the attachment of the middle turbinate may also produce CSF leakage. Posterior orbital osteotomies and soft tissue transection have the potential for direct injury to the optic nerve or the internal maxillary artery; thus, they should be performed cautiously. All instrumentation needed to control brisk bleeding should be on hand. A surgical obturator is ideally molded preoperatively so it can be used after the resection to achieve immediate oral/nasal separation. It also helps to pack the cavity, which helps to bolster the skin graft or flap, and lets the patient resume an oral diet in the early postoperative period. Preoperative evaluation should include a detailed nasal endoscopy to inspect the intranasal anatomy and examination of the oral cavity, orbit, and cranial nerve function. Establishing the function of the inferior orbital nerve and integrity of the bony walls of the maxillary sinus to determine if the tumor has spread outside its boundaries is important: anteriorly into the soft tissues of the cheek, posterolaterally into the infratemporal fossa, superiorly into the orbit or intracranial fossa, or medially into the nasal cavity. All patients are evaluated preoperatively with CT scanning, MRI, or both. CT provides exquisite details of the bony anatomy, and the administration of contrast estimates the tumor vascularity. 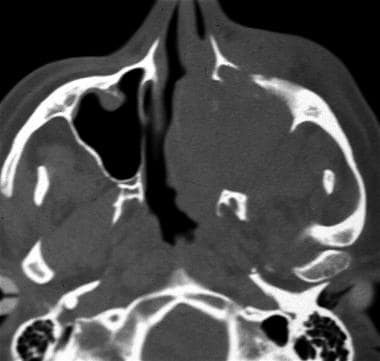 CT scanning is usually the first choice to image tumors of the maxillary sinus (see the image below). CT scan of a patient with a maxillary sinus tumor in the axial plane. Note the detailed bony anatomy. Tumor size and true extension, however, can be difficult to assess, as it is difficult to differentiate tumor from retained secretions within the sinuses. MRI better delineates the soft tissues, especially the tumor interfaces, and can distinguish tumor from retained secretions. MRI also may demonstrate perineural spread not evident on CT (see the image below). 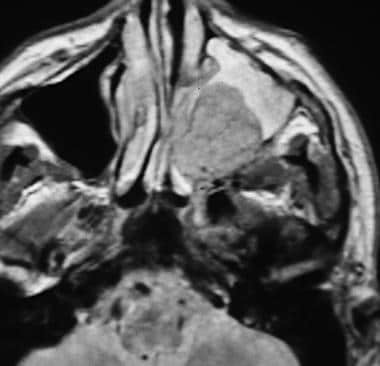 MRI of a patient with a maxillary sinus tumor in the axial plane. Note the differentiation of secretions and tumor as well as the evidence of perineural spread. Histological confirmation often requires extensive sampling that should be completed prior to surgical excision. Biopsy specimens may be obtained directly transnasally, transorally or, in rare circumstances, through a gingival buccal incision and anterior antrostomy. Excisional biopsy may be justified in some circumstances. Preoperative evaluation by a maxillofacial prosthodontist allows the design of a surgical obturator, which as previously mentioned can be inserted in immediately after completion of the procedure. A surgical obturator also facilitates the construction of the temporary prosthesis. Communication of the planned extent of resection is essential to the design of the prosthesis. An unplanned extension of the resection may require the addition of acrylic or additional modifications for an effective fit. Extension into the orbit indicates an ophthalmologic consultation to better assess ocular function. The surgical technique of a total or complete maxillectomy has remained relatively unchanged over the past 60 years. Various incisions and extensions to the skull base, infratemporal fossa, and orbit have been described. These should be used as dictated by the patient's needs and tumor extent. The authors hereby describe the technique of a total or near total maxillectomy, selected partial resections (such as a medial maxillectomy), and the most common extension (orbital exenteration). Total maxillectomy with or without orbital exenteration is most commonly performed through a transoral gingivobuccal incision (see the image below). Gingivobuccal sulcus incision often utilized for exposure. This can be performed with or without a modified lateral rhinotomy incision (straight incision lateral to the nose not extending around the nasal ala). Alternately, a traditional lateral rhinotomy can be performed (see the image below). Incision utilized for a lateral rhinotomy approach where a straight incision is made at the naso-maxillary junction followed by a curvilinear incision around the nasal ala.
A small lateral canthotomy aids to expose the malar and orbital boundaries. A classical Weber-Ferguson extension along the inferior orbital lid (or a modified transconjunctival incision) is occasionally added for select extended approaches (ie, orbital exenteration, infratemporal fossa, or skull base approaches) dividing the upper lip on the ipsilateral side of the philtrum (see the images below). Incision utilized for a classical Weber-Ferguson with extension along the inferior orbital lid, often required for a total maxillectomy. Placement of the incision placed on the ipsilateral philtrum; this aids in exposure with acceptable cosmesis. Regardless of the incisions, they are carried down through the periosteum to facilitate the elevation of the cheek flap over the anterior maxilla in a subperiosteal plane. An important exception to this approach should be made if tumor has invaded or penetrated through the anterior wall of the maxillary sinus because this tissue should be attempted to be excised en bloc. The infraorbital nerve is divided as it is encountered during flap elevation, and it can be sampled to confirm the absence or presence of perineural invasion. After elevation of the cheek, the inferior and medial periorbita is elevated to expose the floor of the orbit, lacrimal fossa, and lamina papyracea. Next, the lacrimal sac is identified, dissected, and retracted, thus stretching and exposing the nasolacrimal duct. The duct is transected at its junction with the sac and the sac is marsupialized. This is best accomplished by dividing the sac and fixating each half to the surrounding periorbita. Stenting is usually unnecessary. This is a critical point in the operation as this exposure gives the surgeon the opportunity to assess and confirm the extent of orbital involvement. Invasion through the periorbita requires histological confirmation, as this information determines whether orbital exenteration should be considered. Next, the inferior orbital rim is transected laterally at the malar buttress, and the medial orbital rim is transected just below the frontoethmoidal suture line. Tumors involving the roof of the ethmoid sinus (fovea ethmoidalis) require extending the resection to the cranial base. If not involved by disease, the ethmoid sinuses may be removed along the frontoethmoidal suture to provide adequate exposure. Care should be taken to orient the cut parallel to the nasal floor to avoid inadvertent entry into the intracranial cavity. Multiple instruments, including a chisel, osteotome, saw, or rongeur may be used to make these cuts, as preferred by the surgeon and/or dictated by the patient’s anatomy (pneumatization and thickness of the bone) and/or extent of disease. Division of the hard palate can be accomplished with an osteotome or reciprocating saw 2-3 mm from the ipsilateral nasal septum (if the oncologic margins allow it). This aids the maxillofacial reconstruction and/or the prosthetic placement and retention. Furthermore, in patients with intact and ipsilateral central and lateral incisors, not involved by tumor, attempts should be made to preserve these to aid the prosthesis retention and maintain cosmesis. This requires that the palatal osteotomy follows the premaxillary-palate junction. At this juncture, the soft tissue attachments between the hard and soft palates are transected intraorally with a unipolar electrocautery or some other sharp instrument of preference. This incision is carried laterally and joins the gingivobuccal incision around the posterior maxillary tuberosity. Osteotomies over the lateral orbital wall and posterior floor of the orbit are completed allowing the down-fracturing of the maxilla. The maxilla is separated from the pterygoid plates using a curved osteotome placed inferior to the pterygomaxillary fissure, just anterior to the pterygoid process. This avoids a direct injury of the internal maxillary artery. However, the artery and some of its branches are frequently avulsed, resulting in arterial bleeding. This is better managed after the specimen has been removed; therefore, leaving this step for last, after all other osteotomies and soft tissue transections have been completed, is best. Following the down-fracturing, the surgeon should quickly transect any remaining posterior soft tissue attachments to the maxilla using heavy, Mayo-type curved scissors guided by palpation. Bleeding may be initially controlled with packing, which will slow arterial and venous bleeding from the pterygoid venous plexus and branches of the internal maxillary artery. These can then be sequentially identified and suture ligated or clipped. Pterygoid veins can be managed with bipolar electrocautery, suture ligature, or topical hemostatics. The specimen is then examined to evaluate the gross margins of the resection visually and select specific sites for additional margins. Histological analysis should confirm the adequacy of the resection before reconstructing the defect. The first step in reconstruction is a dacryocystorhinostomy (DCR), which is performed as previously described. Once the adequacy of the lacrimal sac marsupialization has been confirmed, the reconstruction of the rest of the orbital walls, especially the inferior orbital floor and rim, can proceed. Note that an anatomic preservation of the orbital soft tissues does not always equate to functional preservation. Both the surgeon and patient should recognize that several factors may compromise the function of the eye. Resorption of orbital fat and wound contracture may result in enophthalmos, diplopia, and restricted range of motion. Postoperative radiation therapy increases the risk of visual compromise by inducing cataract formation, fat atrophy, and scar formation. If removal of the orbital floor was undertaken, reconstruction can proceed with alloplasts, such as a preformed implant (Medpor-Porex Surgical Products, Newnan, GA) or titanium mesh or autologous tissues, such as free cartilage or bone grafts or osteocutaneous free microvascular flap,  depending on the size of the defect, as well as preference and experience of the surgeon (see the image below). Reconstruction of the inferior orbital rim with titanium mesh following a maxillectomy with orbital preservation. If the cavity is not reconstructed (no free microvascular flap), the inner aspect should be lined with a split-thickness skin graft or acellular dermis. These promote rapid healing and prevent contraction of the surgical cavity, which produces the subsequent collapse of the mid face. The scar band that develops at the interface of the skin graft and the remaining buccal mucosa often aids to secure the prosthesis. The ipsilateral temporalis flap or temporoparietal fascia flap is used to cover the orbital floor implant. In select cases, it may also be used to obliterate the cavity. However, flap tends to atrophy, and the cosmetic results at long term are inferior to those obtained with a free microvascular flap (eg, rectus abdominismicrovascular flap). Grafting is not required if a tissue flap is used to fill the defect. If a surgical obturator was designed preoperatively, it can be inserted and secured with its own retaining clasps. Alternatively, if the dentition does not allow adequate retention of the obturator, 2 lag screws can be placed through to the remaining hard palate. Holes may be drilled in the posterior aspect of the splint to allow sutures to be placed from the soft palate to the splint. This reduces oro-nasal reflux and facilitates the early return to a normal diet. When closing the wound, the medial canthal tendon is sutured to a Y- or T-plate (1.5 mm) fixed to the ipsilateral nasal bone. The horizontal plate is screwed to the remaining nasal bone while the vertical plate extends to a point corresponding to that where the medial canthus was originally attached. The periosteum of the nasal bone and the skin incision is meticulously closed in layers. The temporary tarsorrhaphy or corneal shield is then removed. Orbital exenteration is one of the most common extensions of a total maxillectomy. An orbital exenteration is indicated when the tumor invades the orbital soft tissues (lids, lacrimal apparatus, globe, muscles, or fat). Orbital preservation is advocated in patients with isolated bony erosion without invasion through the periorbita. An exenteration requires palpebral incisions (or lid sacrifice) that can be incorporated into other incisions used for the maxillectomy. In general, both upper and lower lids should be preserved unless involved by tumor so they may be closed shut at the completion of surgery. Resection of the lower lid may be necessary if the tumor extends through the orbital septum. If not involved, the incision may be extended through the conjunctiva of the lower lid, which will allow the cheek flap to be reflected laterally. If complete resection of the entire orbital contents is required, an incision may be made through the conjunctiva of the upper lid. After appropriate skin incisions have been chosen, the dissection is carried posteriorly along the roof of the orbit, transecting the supraorbital neurovascular bundle. The anterior ethmoid artery is encountered at the ethmoidal suture, approximately 24 mm posterior to the anterior aspect of the lacrimal crest. This artery should be isolated and ligated with clips or sutures. Ten to twelve millimeters posterior to the anterior ethmoidal artery, the posterior ethmoidal artery is encountered and should be clipped or carefully cauterized with a bipolar electrocautery, as the optic canal is located 4-6 mm posterior to it. Circumferential mobilization of the contents of the orbit exenterates the eye separate from the maxilla. Commonly, the eye may be left attached to the inferior orbit. To facilitate exposure of the orbital apex, the globe may be decompressed with a large-bore needle. After the optic nerve is identified, it is clamped and transected, and the ophthalmic artery is bipolar-cauterized or tied with permanent suture. Care must be taken to transect the optic nerve and neurovascular bundle of the superior orbital fissure flush with the inner aspect of the orbital walls. Potentially, the ICA can be injured if the nerves are followed proximally. Following isolation of the orbital contents, osteotomies are performed in a fashion that is similar to that previously described to separate the ethmoid from the frontal bone at the frontoethmoidal suture. Lateral osteotomies are used to separate the superior orbital rim from the specimen. Preservation of as much lateral orbital rim and maxillary buttress as oncologically possible yields better cosmesis. Once the medial and lateral osteotomies are made, the orbital specimen is removed in continuity with the maxillary specimen. At this point, the reconstruction can proceed as previously described. 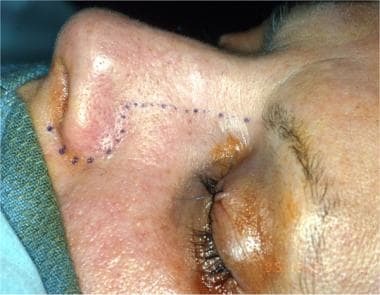 If the lids are preserved, the conjunctival margins should be denuded on both the upper and the lower lids, and the lid margins are sutured together. A temporalis flap may be transposed into the cavity to facilitate grafting with split-thickness skin. The most common indication for a medial maxillectomy is a benign tumorlike inverted papilloma. This can be performed through a lateral rhinotomy incision, or a mid-facial degloving; however, this procedure is currently most commonly performed endoscopically. For the endoscopic approach, the rod-lens scope should be positioned in the superior aspect of the nostril so that instruments can move beneath, unencumbered into and out of the nasal cavity. Cotton pledgets soaked in oxymetazoline or epinephrine produce vasoconstriction that leads to both a decongestant and hemostatic effect. This greatly improves visualization and access. To further assist the surgery, the middle turbinate is gently medialized using a Freer elevator, and 1 or 2 pledgets are placed in the middle meatus. If access to the middle meatus is hindered by a bulky middle turbinate, concha bullosa, or paradoxical turbinate, a straight biter or turbinate scissors may be used to remove the anterior head of the turbinate, thus improving visualization. Any disease process that obstructs access to critical structures is removed in a piecemeal fashion. The principles of en-bloc resection are not as important as achieving a complete resection of the lesion with clear microscopic margins. An uncinectomy is performed using a retrograde forceps to make a window and a free edge that can then be engaged with a microdebrider or true-cut forceps up to the level of the agger nasi cells. The natural ostium is usually visualized opening diagonal to the axis of the lateral wall. It can also be identified by gently inserting a right-angled ball tipped probe lateral to the uncinate process. A microdebrider or cutting instruments may be used to safely enlarge this ostium posteriorly to the back wall of the antrum, inferiorly to the level of the inferior turbinate, and superiorly to the level of the lamina papyracea. The rest of the medial maxillary wall can be removed leaving a communication between the antrum and the nasal cavity that comprises the area anterior to the posterior maxillary wall, superior to the floor of the nose, inferior to the orbit, and posterior to the lacrimal bone. Modifications that spare the inferior turbinate have been described. The medial maxillectomy can also be extended anteriorly to even include the bone of the piriform aperture (endoscopic Denker’s approach). If the lacrimal bone is to be sacrificed, its bony canal is removed and the nasolacrimal duct is transected sharply. If postoperative scarring is a concern, an endoscopic DCR is performed, but this is usually unnecessary if the duct is transected sharply. Residual disease in the maxillary sinus may be removed using curved instrumentation and angled lens scopes. Alternatively, direct access can be obtained via an anteromedial maxillotomy (Denker’s approach) or via anterior antrostomy (Caldwell-Luc like) through a gingivobuccal incision. If removal of the lamina papyracea is required, anterior and posterior ethmoidectomies are completed starting medially in the sinus lateralis and proceeding laterally with caution as the lamina is approached. Dissection should also be taken from inferior to superior with care taken as the anterior skull base is approached. Various instruments can be used, including true-cut forceps, microdebrider, or J-curettes, depending on surgeon preference. Once the lamina has been skeletonized, it can be gently fractured with a Freer dissector and elevated, leaving the underlying periorbita intact. If a significant periorbital laceration occurs, it should be repaired to prevent enophthalmos. Airway monitoring should be performed during the acute postoperative phase. Tracheostomy is rarely required and, furthermore, the authors prefer early extubation (in the operating room) to prevent ventilator-associated complications. If the orbital contents are preserved, frequent visual checks are indicated. This signals any signs of optic nerve compromise from overpacking of the defect or retro-orbital hematoma. Nasal saline spray is initiated immediately to prevent crusting of the nasal cavity. Early mobilization is critical to prevent thrombotic and pulmonary complications. While in bed, the head should be elevated 30 º. A diet may be progressed to soft-mechanical rapidly. Once the patient is tolerating an oral diet, ambulating, and showing signs of recovery they may be discharged, usually 2-5 days following the operation. Follow-up should be arranged in 1 week to remove any packing and sutures. Usually after 3 weeks of appropriate recovery the patient may be referred to the maxillofacial prosthodontist for a more permanent prosthesis. Although the spectrum of complications can range from mild to severe, and reversible to permanent, thinking of them as acute versus chronic in nature is easier. Acute complications include intraoperative or immediate postoperative hemorrhage. This is most likely from the internal maxillary artery and should be controlled with clips or suture ligation. Occasionally, angiography and embolization may be preferable because it does not disturb the surgical field. Other intraoperative complications include corneal injury from improper placement of the corneal shield or tarsorrhaphy. In addition, visual acuity may be compromised, either from injury to the optic nerve during the procedure or from overpacking of the maxillary defect, causing vascular compromise to the nerve. If an acute decrease in visual acuity is detected, the packing should be removed and an ophthalmological consultation should be initiated. Oral contents may reflux of into the nasal cavity, either from velopharyngeal incompetence or through a breakdown of the soft palate at the posterior aspect of the palatal prosthesis. This can be managed in the acute phase by naso-gastric tube feeds. Eustachian tube dysfunction can complicate 20-25% of patients following maxillectomy. This can be treated with placement of a ventilation tube, if it is persistent. Epiphora can be seen in the immediate postoperative period, usually from swelling surrounding the DCR; this resolves quickly and spontaneously. Intermediate complications include infection, failure of prosthesis, and or flap failure (most commonly from necrosis). Chronic complications include trismus from scarring around the muscles of mastication, decreased facial movement due to scar formation, chronic epiphora, unacceptable cosmesis, and velopharyngeal incompetence. All these surgical complications may be exacerbated by the use of postoperative radiotherapy. Long-term follow-up is dictated by the disease process and patient risk factors. Ophthalmologic follow-up should also be performed if the orbit is preserved to monitor for ischemic complications, radiation-induced complications, or enophthalmos. Using a prosthesis for reconstruction (preserving an open cavity) facilitates the surveillance of the cavity for recurrence; however, these prosthetic devices require frequent and meticulous care. Conversely, use of a soft tissue flap for the reconstruction compounds the surveillance. Sensitivity and specificity of the physical examination under these circumstances is poor; therefore, sequential MRI and PET or PET-CT are necessary to assess for recurrence. Patients should be thoroughly educated about the potential complications (mentioned above), for informed consent and so that they maybe proactive in recognizing and bringing any concerning signs or symptoms to the attention of the physician. McGuirt WF. Maxillectomy. Otolaryngol Clin North Am. 1995 Dec. 28(6):1175-89. [Medline]. Portmann G, Retrouvey H. Le cancer du nez. Paris, Gaston Doin et Cie. 1927. Maniglia AJ. Indications and techniques of midfacial degloving. A 15-year experience. Arch Otolaryngol Head Neck Surg. 1986 Jul. 112(7):750-2. [Medline]. Smith RR, Klopp CT, Williams JM. Surgical treatment of cancer of the frontal sinus and adjacent areas. Cancer. 1954 Sep. 7(5):991-4. [Medline]. Ketcham AS, Chretien PB, Van Buren JM, Hoye RC, Beazley RM, Herdt JR. The ethmoid sinuses: a re-evaluation of surgical resection. Am J Surg. 1973 Oct. 126(4):469-76. [Medline]. Barbosa JF. Surgery of extensive cancer of paranasal sinuses. Presentation of a new technique. Arch Otolaryngol. 1961 Feb. 73:129-38. [Medline]. Donald PJ. Recent advances in paranasal sinus surgery. Head Neck Surg. 1981 Nov-Dec. 4(2):146-53. [Medline]. Sessions RB, Larson DL. En bloc ethmoidectomy and medial maxillectomy. Arch Otolaryngol. 1977 Apr. 103(4):195-202. [Medline]. Waitz G, Wigand ME. [Endoscopic, endonasal removal of inverted papillomas of the nose and paranasal sinuses]. HNO. 1990 Jul. 38(7):242-6. [Medline]. Kreeft AM, Smeele LE, Rasch CR, et al. Preoperative imaging and surgical margins in maxillectomy patients. Head Neck. 2012 Nov. 34(11):1652-6. [Medline]. Ohngren LG. Malignant tumours of the maxillo-ethmoid region: a clinical study with special reference to the treatment with electrosurgery and irradiation. ActaOtolaryngol (Stockh). Plast Reconstr Surg. 1933. 19(Suppl):1-276. McCarthy CM, Cordeiro PG. Microvascular reconstruction of oncologic defects of the midface. Plast Reconstr Surg. 2010 Dec. 126(6):1947-59. [Medline]. Kinnunen IA, Schrey A, Laine J, Aitasalo K. The use of pedicled temporal musculoperiosteal flap with or without free calvarial bone graft in maxillary reconstructions. Eur Arch Otorhinolaryngol. 2010 Aug. 267(8):1299-304. [Medline]. Kumar P, Alvi HA, Rao J, Singh BP, Jurel SK, Kumar L. Assessment of the quality of life in maxillectomy patients: A longitudinal study. J Adv Prosthodont. 2013 Feb. 5(1):29-35. [Medline]. Chigurupati R, Aloor N, Salas R, Schmidt BL. Quality of life after maxillectomy and prosthetic obturator rehabilitation. J Oral Maxillofac Surg. 2013 Aug. 71(8):1471-8. [Medline]. Moreno MA, Skoracki RJ, Hanna EY, Hanasono MM. Microvascular free flap reconstruction versus palatal obturation for maxillectomy defects. Head Neck. 2010 Jul. 32(7):860-8. [Medline]. Weber RK, Werner JA, Hildenbrand T. Endonasal endoscopic medial maxillectomy with preservation of the inferior turbinate. Am J Rhinol Allergy. 2010 Nov-Dec. 24(6):132-5. [Medline]. Sakai S, Kubo T, Mori N, et al. A study of the late effects of radiotherapy and operation on patients with maxillary cancer. A survey more than 10 years after initial treatment. Cancer. 1988 Nov 15. 62(10):2114-7. [Medline].